I have returned from my 6,000+ miles vacation trip under the supervision of my eldest daughter. We attended our Scottish Clan Gathering and reunion in Manchester, TN and renewed old acquaintances and met new to the gathering family members. We traveled through CA, MO, TN, KY, OK, KS, CO & NM taking 6 weeks to accomplish the trip. I experienced one of the most impressive and memorable events of my Masonic career in Kingston, TN where I attended the 142 annual Cave Degree. The sublime degree was conferred by a North Carolina Lodge in commemoration of 200 years of Freemasonry in TN. NC chartered the first lodge in TN. The Cave Lodge room is located about 6 miles out of Kingston, TN. There were 275 Master Masons in attendance. The Grand Master of TN and several members of his corps of Officers were in attendance. Attendees represented 18 Grand Lodges in the USA and 1 from Ontario, Canada. A complete 3rd Degree ritual team comprised of more than 25 members conferred the degree in exemplary form for one very brave mason. The event was preceded by Lunch provided by Union Lodge in Kingston, TN. I also witnessed a NC Entered Apprentice Degree on Friday night preceding the Saturday Cave degree. That team was made up of 7 NC lodges. My purpose in relating the above is that the Future of Freemasonry and all the append ant & concordant bodies lies in the Craft Lodge. There will be no Scottish Rite, York Rite or other masonry without our support in the Craft Lodge. When did you Last attend Lodge? Remember our Stated Meeting on September 10th and our Recognition Night for all Military participants. Reservations are not an Option. "I'm always there" is not good enough. E-mail or call in your reservation, now. The Fall Reunion has undergone many changes. Copies are available outside the Scottish Rite Office as you enter the building. Plan to attend the Reunion and help the degree teams impress our candidates. Degree teams are always looking for additions to casts. If you have an interest, contact one of the degree directors. Attention Knights of St. Andrew. The KSA meets at 7:15pm at the Scottish Rite Temple on the first Tuesday every Month. 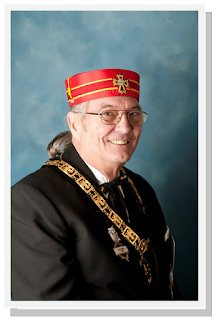 This Black Hat, 32°, organization is ever looking for members who want to be of service to the Scottish Rite. There are opportunities in supporting the Reunions as degree members, stage hands and/or greeters. Other. The KSA also participates in Parades and assists with other Scottish Rite Functions. Please renew your interest in the KSA by contacting the Chief Knight or other Officers of the KSA. The kids are back to school, vacation time is drawing to a close so we hope to see you back at Scottish Rite.